Yvonne, A Cow Wrapped In A Mystery Inside A Forest : The Two-Way In Germany, a dairy cow named Yvonne's death-defying escape, and ability to avoid capture, is a symbol of freedom and animal dignity. That may be hyperbolic — but how else to explain scores of visitors to Yvonne's Bavarian commune, or the 10,000-euro reward for her safe return? 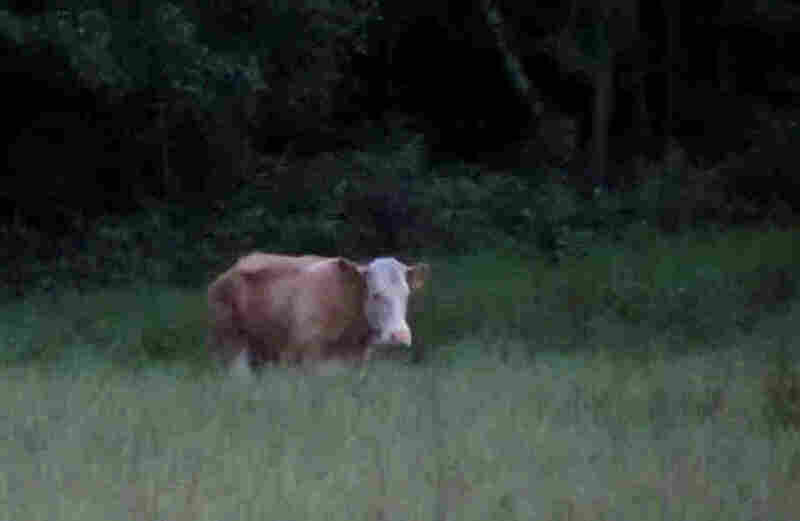 A cow named Yvonne has eluded capture since escaping a German farm in May. She's been spotted roaming a forest, but searchers haven't been able to get close to her. Now an animal psychic has been called in. In Germany, a dairy cow named Yvonne's death-defying escape — and continued success in eluding capture — has become an incandescent symbol of freedom and animal dignity. Okay, that may be hyperbolic. But how else to explain scores of visitors to Zangberg, the Bavarian commune Yvonne calls home, or the 10,000-euro reward offered for her safe return? 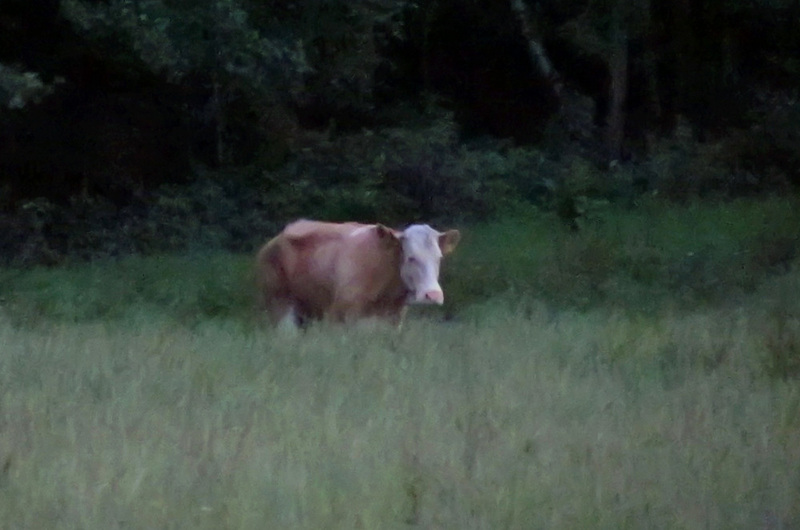 Curious visitors and search parties have been romping through the woods around Zangberg, looking for signs of the cow. Yvonne has been at large since she breached an electric fence on her farm nearly three months ago, on May 24. Since then, she's adopted a lifestyle that might be called Sherwoodian: sticking to forests, eluding police, and bringing acclaim and tourist dollars to her quaint village. Yvonne, 6, escaped just before she was due to be sent to the slaughterhouse. But her life of freedom hasn't been without risks. She narrowly missed being struck by a police car; hunters were given permission to shoot her on sight. Food traps were laid; a beagle hunting dog was enlisted. Companion cows were sent in, to draw her out. But all to no avail. "Yvonne knows exactly what she's doing, and she's tricking us," the manager of an animal rescue farm told a German newspaper. The same paper, the Sueddeutsche Zeitung, says that Yvonne has now become a type of freedom fighter "for the animal-loving republic." Perhaps conceding the battle of wits — and the public-relations war — to the ruminant, officials are now hoping they can reach her through her heart. They're bringing in a male ox named Ernst, who they hope will capture Yvonne's heart, and lure her back to human society. Franziska Matti, an animal communication expert from Berne in Switzerland, said she had managed to contact Yvonne using telepathy. "I spoke to her yesterday and she said that she was fine but didn't feel ready to come out of hiding," said Matti. "She said she knew that Ernst had been waiting for her but that she was scared. She said she thought that humans would lock her up and she would no longer be free." Perhaps Matti can relay the latest offer from Gut Aiderbichl. The preserve wants to pay Yvonne's owners 600 euros ($867) and give the cow "a paddock with grass to graze on for the rest of her days," The Guardian reports. That arrangement may not suit Yvonne, which the tabloid Bild calls "the cow who would rather be a deer." Bild is also the magazine behind the 10,000-euro ($14451) reward. The tabloid's reward also hints at one reason why Yvonne's story has become a source of hyperbole: other than flurries of bad news, summer is traditionally a slow time for media. But in this case, Zangberg Mayor Franz Märkl says that both his village — and Yvonne — are profiting from the attention. "It's unbelievable how famous she's become – for sure nobody would dare shoot her now," Märkl told Süddeutsche Zeitung.